I Love You More Than Carrots: What's New / Let's Catch Up / Real Mom, Real Style. What's New / Let's Catch Up / Real Mom, Real Style. Tap, tap tap. Is this thing still on? Shoo! I never intended to step away from this space as much as I have over the last several months. I don't even have a good enough reason for my absence other than it was summer and we were busy! 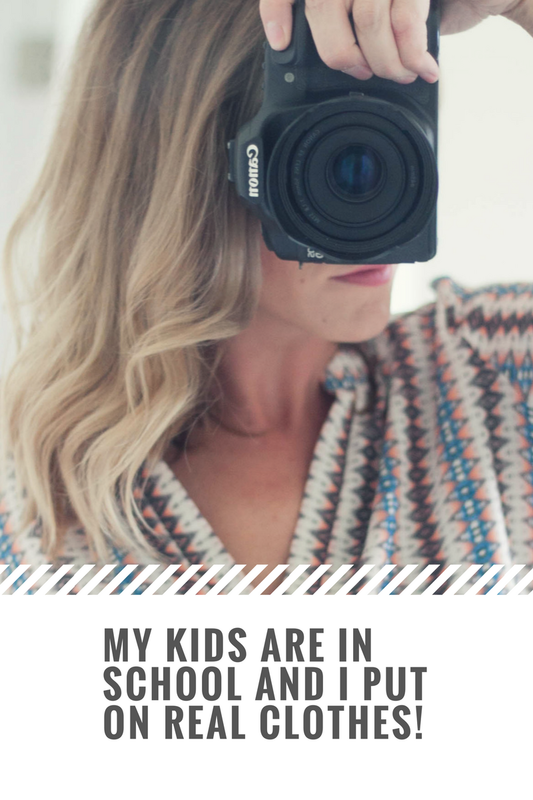 I have so many things I want to write about here, things like my feelings on this article, what life is like basking in the light at the end of the tunnel of raising tiny, needy humans (spoiler alert: it's freaking fantastic), new house updates and really, just getting back to the basics of why I started this blog in the first place. School is back in full swing now and the boys are gearing up to finish their first full week since starting right after Labor Day. It's an adjustment for everyone and I've essentially renamed September "The Month of Grace" because there's no way we're all getting through it without a healthy dose of patience, understanding and candy corn pumpkins in excess. The boys love school though which is the most I can ask for- Collins, the youngest, wishes he could go every day and isn't that the funniest thing? I'm certain that if given the opportunity, my oldest would stay at home with me forever but it's those third babies that are so ready to grow up that they don't even think twice about leaving the nest! He just wants to be big like his brothers and do what they do. Bless it! A few weeks ago on Instagram I put some feelers out about what you might want to see more of from me. Surprisingly, the answer was a resounding "what do you wear because you always look so cute?" (which made me laugh because are we both watching the same snaps?) with some of you wanting to see more of the house and most of you wanting to just hear more about what life looks like now with the boys many of you have watched grow up over the last 7 years. Now that I have some time to myself during the week, I think I can make that happen! Having all of the boys in school each week is incredible. Keep in mind that Collins is currently in school for 8 hours each week so it's really only 8 hours that I'm kid-free but what a difference those 8 hours makes in terms of self-care. Mac also transitioned from 5 half-days to full day Kindergarten this year and while I miss his guts like crazy, I can get my hair done, schedule doctor and dentist appointments for myself, make it to the gym, shower, DO MY HAIR, get dressed and meet my girlfriends for lunch TWO DAYS A WEEK all without worrying about the littlest one and who I'm going to get to watch him and how that's all going to factor into everyone's schedule and how will I ever make it back for half-day pick up? This new routine of ours has done wonders for my general well-being but more on that in a post for another day. I figured I'd start off here with a peek into my closet mostly because this is probably the most I've gotten dressed up in a week since 2010. Before I proceed, however, here's what you won't see in this post: expertly staged and styled photographs, affiliate links to where you can shop my look or any type of dressing room photo. I'm all about the collective "you" doing "you" but I'll be honest, I'm just not that committed. Plus, dressing room photos, while adorable, always make me laugh because most of the bloggers I follow who do this are as big as my pinky and nothing I buy will look the same on me as it does them. That said, I will gladly share where I found most of the clothes I'm wearing but I also kind of feel like that's why Google and SHOPSTYLE were invented. While I started off strong, there's a good chance that not every week will look like this but it's certainly been fun playing the roll of "Mom With Her Sh*t Together" versus my usual typecast "Leader of the Hot Mess Express." Next time I do this, I promise I'll wipe down the mirror first but don't those tiny handprint smudges add a little je ne sais quoi to the over all aesthetic? The weather here in Maryland has been all over the board lately- while we've had some incredible Fall-ish days in the 60's, the next 7-10 days are shaping up to be some hot ones! I just want to commit to putting away all of my summer clothes and close the chapter on shorts and sundresses, I won't lie! As you can see, I've got a pretty good thing going with the raw hem denim. 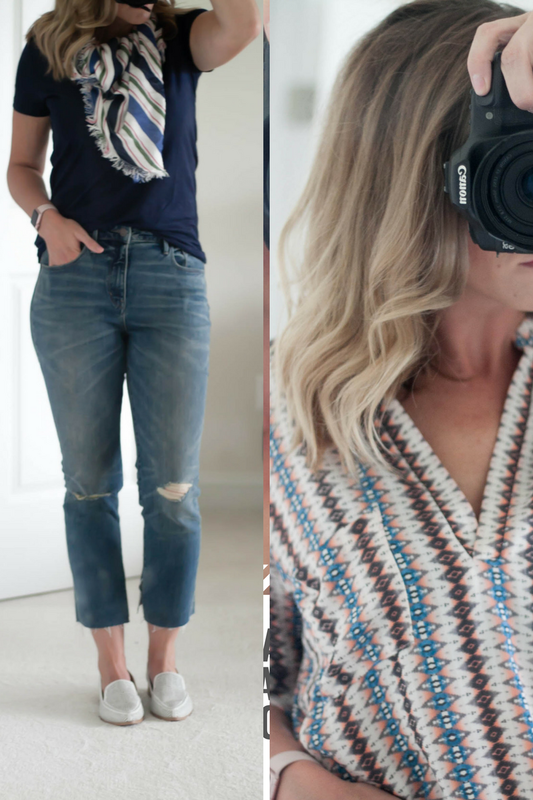 The last three pairs of jeans I've added to my closet all have that and torn knees in common and the nice thing about it is that if you're not feel particularly committed to the hem on any given day, you can just pin roll the bottoms and voila! Bye-bye frayed edge. The black pair seen above are by FRAME, the blue pair below are Democracy Denim and the pair seen in the last photo are Treasure & Bond, all purchased at Nordstrom or The Rack. I also tried out a pair of the Yummie brand high-waisted leggings and I can't say that I hate them! I love being able to throw them on with a sweater and not have to worry about whether or not they're too opaque (they're actually rather thick which will be great once it gets colder!) I wish I had gotten a better picture of the Treasure & Bond sweater- it has an asymmetrical cold shoulder and I really kind of love it. My printed top is one of the infamous LUSH tunics and they're truly a staple in my closet. Over the years I've purchased them in several solid colors and prints and I wear them all the time. Super comfortable and can be dressed up or dressed down. This top is one of my favorites, given to me by my aunt from a local boutique. 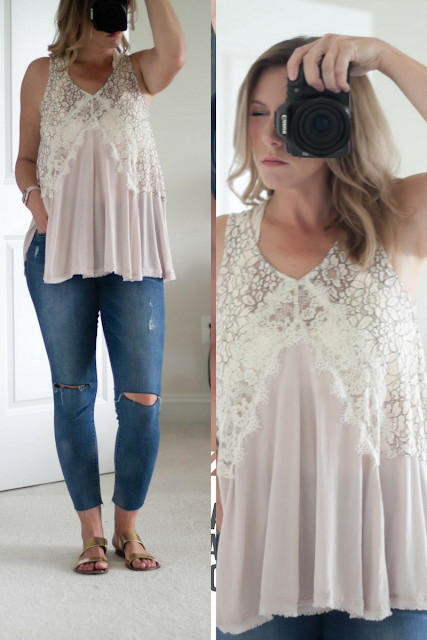 I love the feminine and flowy details of it and it's actually one of the few warm weather pieces I keep in my closet all year long. When the cooler months hit, I pair it with a cropped leather moto jacket which buys my an extra season of wear! I love a good t-shirt and jeans get up. More times than not, that's usually what I'm wearing if I'm not in work-out clothes! While you can't see it in the above photo, it's always a v-neck t-shirt! This one is from the new Target line "A New Day" that replaced the old Mossimo brand. They recently had a Buy Two for $14 sale and I stocked up on navy and gray! 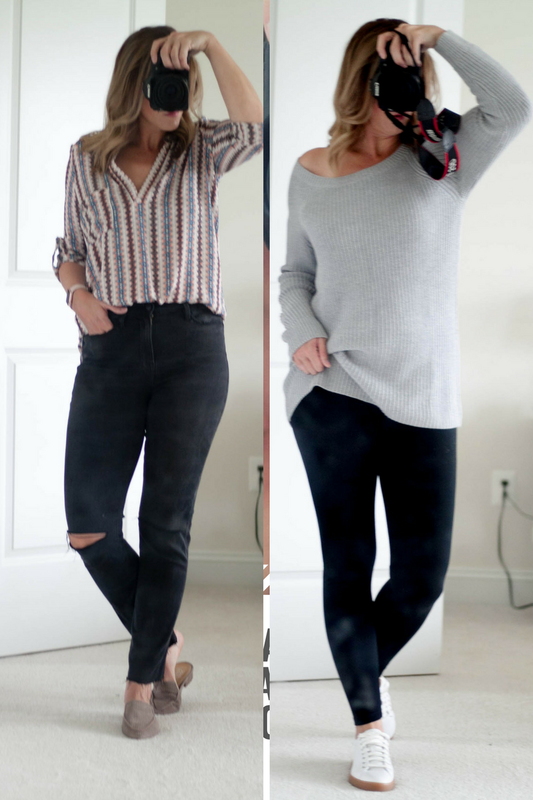 I have no idea how well they wash or wear and while my hopes aren't too high, I'm all about cheap closet staples that can be worn on repeat, especially things that can be layered for extra wear. You may not think this is very exciting but coming from someone who has worn more breathable spandex in the last five years than anything else, it's a pretty big deal. Even my husband has noticed the lack of athletic-attire and while I never thought about it affecting my mood, getting dressed in "real clothes" each day does wonders for a mom's sanity. Love that you are going to start blogging more! I always enjoy reading your posts! I had never read your blog before and just loved reading it now! so fun! Im about to have my third and I get 9 hours of week to myself for the next 2 weeks! haha It is a game changer indeed! what about the shoes! specifically those pretty slip on mules?! :):) And yes - more of these!! !